A new Combat Crew with unusual training and experience. 269 - 06 Nov 1944 to Bottrop/Hamm, Ger. 270 - 09 Nov 1944 to Metz, Ger. 271 - 10 Nov 1944 to Cologne, Ger. 273 - 16 Nov 1944 to Weisweiler, Ger. 275 - 21 Nov 1944 to Merseburg, Ger. 277 - 26 Nov 1944 to Altenbecken, Ger. 1Lt Chet H. Jameson, Jr. (P)(POW) - Was a B-17 Instructor Pilot in the USA before his crew was formed. 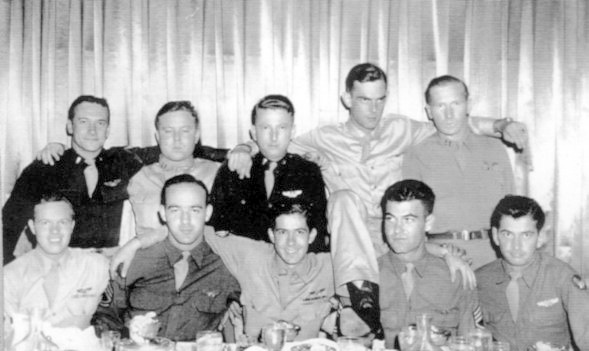 All seven mission flown as 1st Pilot.. Mission #269 flown with a combat orientation CoPilot, 2Lt Harry S. Seidel. 2Lt Robert N. Blazey (CP)(POW) - Stood down on mission 269. Flew on six missions with 1Lt Jameson (270, 271, 272, 273, 275, 277). Capt James M. "Tailwheel" Kaiser (N) - Replaced original USA crew Navigator, 2Lt William E. Sundeen after crew was assigned to the 358th BS at Molesworth. Was awarded the Silver Star Medal for action against the enemy at Tobuck Harbor on 6 November 1942 on a B-24 bomber while an Aviation Cadet Navigator with the 513thBS/376th BG(H). Assigned as the 1Lt Jameson Crew Navigator at Molesworth and flew on the Jameson Crew's first three missions (269, 270, 271). 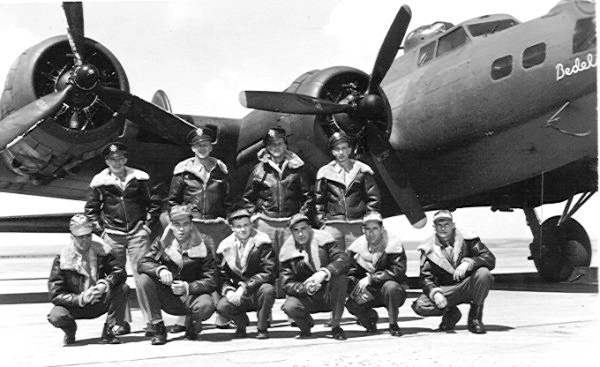 Was reassigned as a Lead Crew Navigator and flew on 18 credited missions in this position (272, 273, 277, 279, 280, 285, 290, 296, 301, 314, 319, 327, 335, 340, 344, 351, 352, 360). Completed 21 credited missions on 15 April 1945 (Mission 360). The 1Lt Jameson crew used substitute Navigators used on four missions: 1Lt Wilson Ford (272); F/O Seymour Kaufman (273); 2Lt Anthony J. Boland (275), 2Lt Maurie S. McDade (POW)(277). 1Lt Wilson Ford (B) - Flew on three missions with the 1Lt Jameson crew: As Bombardier (269, 271); As a substitute Navigator (272). Was reassigned as a Lead Crew Bombardier and flew on 16 credited missions in this position (277, 279, 285, 290, 291, 301, 314, 319, 327, 335, 340, 344, 351, 352, 360). All of his Lead Crew missions where flown where Capt James M. Kaiser was the Lead Crew Navigator on the same Lead Crew. Completed 19 credited missions on 15 April 1945 (Mission 360). The 1Lt Jameson Crew used substitute Toggliers on five missions: T/Sgt Robert L. Garzia (270), S/Sgt John L. Stevenson (272, 273, 275); Crew WG - T/Sgt Ferdinand P. Haevers (POW)(277). S/Sgt Hoots (TG) - Stood down on mission 272 - Substitute TG - S/Sgt Gasper Pizzolato, Jr.
T/Sgt Heavers (WG) - Flew as crew Togglier on mission 277 - Substitute WG - S/Sgt Gasper Pizzolato, Jr. (POW).